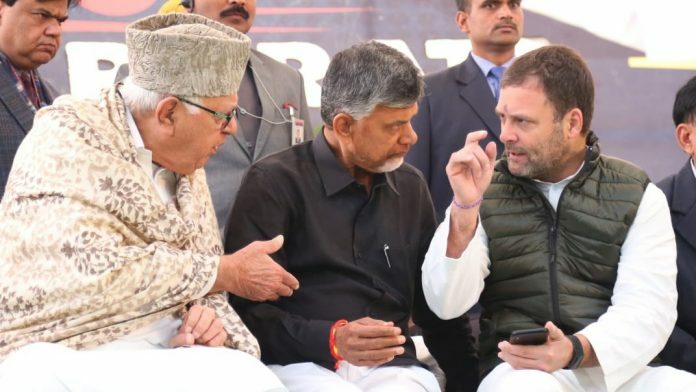 At Naidu's protest for Andhra special status, opposition leaders Rahul Gandhi, Manmohan Singh, Farooq Abdullah and Derek O'Brien show up for solidarity. 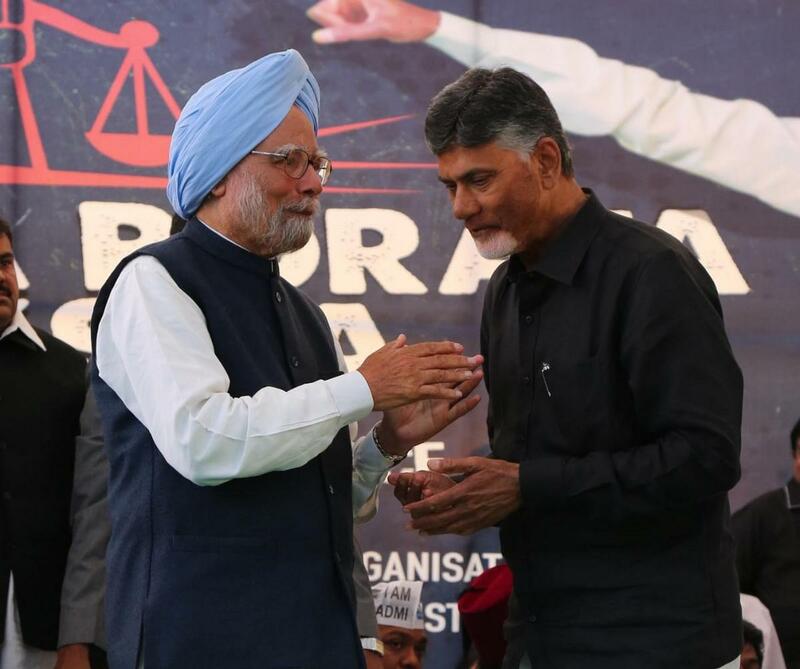 New Delhi: Former prime minister Manmohan Singh and Congress president Rahul Gandhi were among a host of opposition leaders who visited and expressed solidarity with Andhra Pradesh Chief Minister N. Chandrababu Naidu, who is sitting on a day-long dharna at the Andhra Bhawan in New Delhi, demanding special category status and fulfilment of assurances made by the Centre after bifurcation of the state. Besides the duo, the National Conference’s Farooq Abdullah and the Trinamool Congress’ Derek O’ Brien also visited Naidu. Delhi Chief Minister and Aam Aadmi Party chief, Arvind Kejriwal, is expected at the venue later in the day. Although the day-long protest is for special category status for Andhra Pradesh, parties opposed to the BJP are using the occasion to showcase opposition unity and attack the prime minister. Naidu said the protest was about the “self-respect of the people of Andhra Pradesh”. “If you won’t fulfill our demands, we know how to get them fulfilled. This is about the self-respect of the people of AP,” Naidu said at the start of his protest. Naidu will meet President Ram Nath Kovind Tuesday to submit a memorandum demanding special category status for Andhra Pradesh. This is the second such gathering of opposition leaders within a month, following the United India rally organised by West Bengal Chief Minister and Trinamool Congress chief Mamata Banerjee in January. Eighteen opposition leaders had participated in the Kolkata rally. Last week, leaders of 22 opposition parties had met Chief Election Commissioner Sunil Arora in Delhi, demanding mandatory authentication of Electronic Voting Machines with voter-verifiable paper audit trail in 50 per cent of polling booths in every Lok Sabha constituency. Opposition leaders, including Naidu, DMK’s Kanimozhi, Rashtriya Janata Dal’s Tejashwi Yadav, had also gone to West Bengal during the week to express solidarity with Banerjee, who was sitting on a three-day dharna to protest CBI’s action against Kolkata police commissioner Rajeev Kumar. opposition parties. They have been holding regular parleys with opposition leaders since late 2018. Naidu has visited Delhi frequently since last year, holding meetings with opposition leaders in an attempt to stitch a grand alliance. Although opposition leaders are meeting each other, no formal announcement on forming a grand alliance has been made so far. This, however, isn’t a first for the Andhra Pradesh chief minister. Naidu was at the helm of alliance formation in 1996-1997, when he rallied opposition parties to form the United Front government. Political observers are also drawing a parallel between the current developments to events in 1983 when similar conclaves with opposition parties were organised by N.T. Rama Rao, the then CM of Andhra Pradesh and Naidu’s father-in-law, to take on the Congress (I). Four opposition conclaves in Vijayawada, Delhi, Srinagar and Kolkata eventually led to the formation of the National Front in 1988 that had seven opposition parties in its fold.